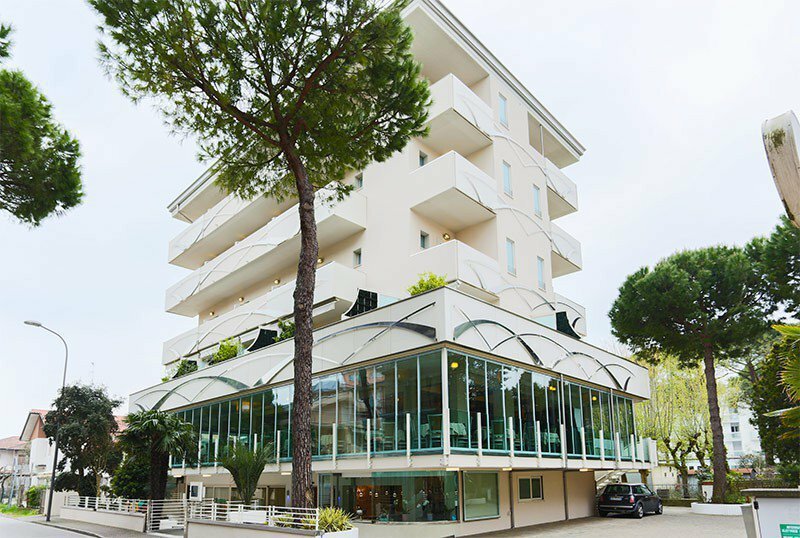 Hotel Caribia, a 3-star superior hotel in Pinarella di Cervia family-run, has recently been renovated and offers tailor-made services for families. It has new rooms, parking, WI-FI connection and beach service with entertainment. This hotel adheres to the Green Booking project and has decided to donate a tree to the coast for a healthier environment and a more sustainable tourism. The hotel is located in Pinarella, a town located south of Cervia, near the beach and not far from the center. The hotel has 32 rooms with modern and elegant furnishings, balcony with chairs, individually controlled air conditioning, LCD digital terrestrial TV, minibar, WI-FI, safe, telephone, bathroom with shower and hairdryer. All are served by the elevator. IDRO: Teuco heated 3-seater hot tub and table on the balcony, courtesy service, bathrobe and afternoon tidying. FAMILIES: quadruple rooms available, consisting of a double bed and a bunk bed. Outside garden furnished with sofas and tables, free bikes, panoramic lift, satellite TV with Sky programs in the hall, reading area with newspapers and beach towels in use. PARKING: uncovered parking spaces, free and available to all customers. AIR CONDITIONING: free, in the common areas and in the rooms. CONVENTIONS: beach, amusement parks, shuttle service from the airport for a fee. BREAKFAST: international buffet breakfast with homemade desserts, ring-shaped cake, pies, muffins, cereals, fruit, yogurt, homemade jam, toasted bread, cheese, cold cuts, bio corner, espresso coffee and cappuccinos. LUNCH AND DINNER: menus consisting of typical dishes of Romagna with fresh pasta, meat and fish dishes, buffet of appetizers, side dishes and hot and cold vegetables. Water with meals. In hotel: strollers, outdoor playground area, cartoons area with television, bicycles with child seats. Upon request and payment, pediatrician and baby sitter service. At meals: seats at the table, bottle warmer, baby cutlery, live entertainment at meal times, dedicated menus, homogenized and meals served at flexible hours. The hotel has an agreement with the Bagno Adriasol n.111 equipped with playground area, bar, restaurant, fitness area, playgrounds, entertainment for adults and children.